Everyone loves going out to dinner. No cooking, no cleaning, fun with friends – the perks are numerous. But some of these perks (i.e., the giant portions and bottomless bread baskets) aren’t great for your waistline. It’s hard to eat out and eat healthy, but it’s not impossible. You can still enjoy a night out to dinner without stressing about the scale. 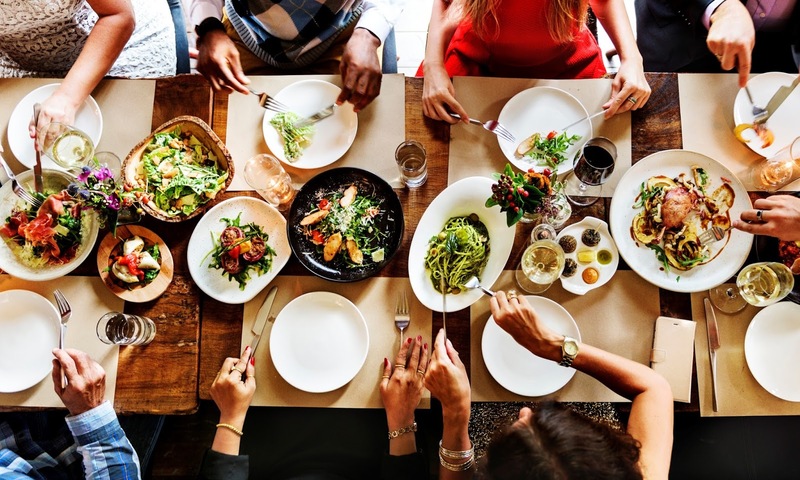 Read below for some of our favorite tips for eating out healthily. A major key to controlling your diet is planning, and we’re not talking about meal prep. Sometimes, staying healthy at a restaurant has nothing to do with what you choose off the menu. 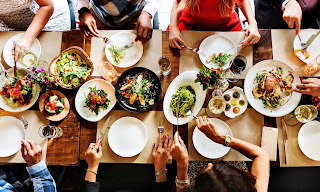 Making a reservation may seem trivial when it comes to weight loss, but think about it – if you plan on eating at seven and there’s a 45 minute wait, by the time you sit down, you’ll be starving and grab the first three dinner rolls at the top of the breadbasket. It’s a recipe for disaster. Always try to make a reservation, but if you can’t and might have to wait, throw a baggie of healthy snacks (nuts, grapes, carrot sticks, granola) in your bag so you have something to munch on while you wait. Appetizers are great, but not all apps are created equal. Choosing to start with a salad over fried calamari or loaded nachos can save you hundreds of calories. Make sure to avoid creamy dressings (Caesar, ranch and blue cheese are loaded with fat), and ask for an oil-based dressing instead, like balsamic vinaigrette. If the salad has croutons, skip those too. If you haven’t yet heard the term “empty calories” on your health journey, it’s time you learn. Calories are units of energy, hopefully derived from the many nutrients inside our food. Empty calories are calories that come from food containing little to no nutrients, and instead are composed mostly of fat or sugar. By avoiding empty calories, you’ll decrease your calorie intake and improve your overall nutrition. Two major culprits with empty calories are soda and alcohol. It’s best to avoid both of these – even diet soda. If you’re out with friends and really want a drink, sometimes sparkling water will give you that extra something you’re craving. Or, on the alcohol side, have one glass of red wine (antioxidants!) or a vodka soda with lime, which is relatively low in calories. Just be careful not to overdo it! Waiters are there to help – so use them! Most restaurants are able to make small adjustments that will really help you stay on track. Things like asking for no croutons in a salad, sauce on the side or a side of veggies instead of French fries can make a huge difference in the calories and fat content on your plate. Ask your waiter, “What is the healthiest thing on the menu?” Unless it’s his or her first day, the server will probably know, or at least be able to give you an educated guess. Don’t hesitate to speak up. The method used to prepare your dinner can make a huge difference calorically. Grilled steak, for example, usually has around 400 calories in an 8-ounce cut, while an 8-ounce chicken-fried steak contains a whopping 700 calories – before the gravy. If you’re having meat for dinner, try to order it grilled. Do You Really Need Dessert? Well – do you? Think about how much money and how many calories you’re saving if you skip dessert. It’s always best to decrease your sugar intake, and a New York Cheesecake after a large meal is not the way to do that. If you’re really craving something sweet, ask for a cup of fresh berries after dinner. The natural sugar will satisfy you without spiking your sugar levels. Remember: Eating healthy is just a matter of making good choices. Armed with these tips, it’ll be much easier to stay on track toward your goal – whether that be weight loss, better nutrition or improved health overall. Healthy eating at restaurants is possible. You’ve got this!